We received a lot of input when we asked pyrents for their best tips for new or prospective pyr owners, so this isn’t a comprehensive list. To read all the other amazing Great Pyrenees tips, head here on Facebook and here on Instagram. What advice would you give to people considering a Great Pyrenees? Unless you are prepared to fall in love with a stubborn, huge fur ball -just say no !! If this is going to be a family pet or companion, this is not a dog that you can put in the backyard for the kids to play with once in a while, Pyrs become your kids and do require a fair amount of attention and loving. Exactly! I’d love to have livestock for my three, but it’s just not in the cards right now. You have to find other ways to work them. So how do you work yours??? I have a puppy and once we redo the fence line we will be getting goats. My other dogs make sure she gets exercise but I always love to read other peoples advice. At Last! 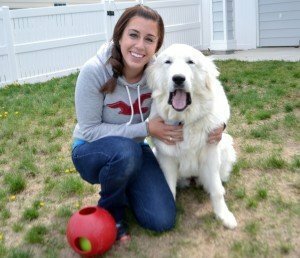 An article that makes sense about Great Pyrenees. I have had four. I loved all of them but two we needed to rehome. Both males we helped rescue. One was a fence jumper, the other was a chicken killer. Only two additional suggestions for this. 1. Be sure you have a good pasture fence or your Pyr will escape. They feel the entire neighborhood is theirs to patrol. They don’t run away but get lost. 2. If you want to train your Pyr and go to a dog trainer, be sure they ‘know’ Pyrs. We took ours to a dog trainer who couldn’t do much with our sweet dog and told me in front of the class ‘that dog isn’t dumb but the owner is!’ Meaning me. We never went back and trained her myself. Like I’ve told lots of people, if you want a dog to play catch, get a border collie. I’ve told so many folks Pyrs are meant to guard not play games, it’s instinct. If yours likes it, well great. Mine didn’t. I’ve got two adult Pyrs, and something I’ve had to tell my husband (a GSD owner) is that you have to adjust your way of thinking. They bark, they’re goofballs, they’re stubborn, and they’re not the kind of dog that is going to play fetch. For me, they’re a personality fit because of my nature. German Shepherds and other high energy herding breeds are not. I’ve got a male and female Pyr, both of whom are of excellent temperament. The key is knowing what kind of personality they have and knowing what you’re getting into. I can’t begin tip tell you how much I liked this article. I have had 8 beautiful, precious, stubborn Pyrkids. They stole my heart and reorganized my soul. As a lifelong rescuer many different needs have come and gone on to fantastic homes and I loved each one dearly. After rescuing my first Pyr I completely lost my heart and can’t imagine life without them. I adopted a Great Pyrenees puppy last July 4th while tent camping in the Smokies. “Smoky”, as I called him, was covered in fleas, had worms, and had to sleep outside our tent, lest we become covered in fleas, too. I immediately de-flead and dewormed him, and we bonded right away. At 8 weeks, I could carry him in my arms, and did. At age 57, my wife thought I was insane. Now, he weighs 105. We already had a senior male, who had bonded to my wife, but I’d lost my favorite companion, a Golden Retriever, the year before to old age. It was time for a challenge. Smoky, like all Great Pyrenees, has turned out to be the greatest dog I have ever owned, and I’ve owned dozens. Not a day has gone by where he has not brought laughter, joy, or fun into our house, and we never cease to be amazed by his antics and his intelligence. Two months ago, I even posted a video of Smoky chasing his tail in sync to a Hall and Oates tune on Youtube, which is filmed live: https://m.youtube.com/watch?v=GZNkzO60tmk I only regret that I was laughing so hard I missed the first 2 minutes of his act! Smoky is a superb watchdog and patrols our 2 acres with the zeal of a palace guard. Yet, he also likes to catch and retrieve a ball or stuffed animal, and when bored, will toss it in the air himself, for himself. One thing we’ve noticed about GPs and their intelligence, is that as they grow up, they create a mental database (knowledgebase) of sights and sounds. If a new sound is encountered, whether live or on the television, you can be sure he’ll bark loudly in alert. Even more intriquing, , if you move a wheelbarrow, or even a shovel, in the back yard from its normal position, he will alert on this visual discrepancy, and approach it like you would a coiled rattkesnake, to determine if it represents a new threat. In my mind, there is no greater, nor more unique, dog breed than the Great Pyrenees. If one needed to program a robot with artificial intelligence, you need look no further for the model than the innate demeanor of these Gentle Giants. Please feel free to post any or all of this for your readers. What a beautiful story. I have my first Great Pyr and I don’t think I will ever own any other breed going forward. These gentle giants dig their way into your heart (almost literally) and mind and soul. They don’t eat much, sometimes just half of what is recommended. I feed Fromm Large Breed. Worth the expense, as it lasts a longer time than expected. Be careful of the food contents. I have had 2 and both were sensitive to corn. Did you know beef and chicken and the top two allergens for dogs/ Grains are *way* down the list, so it’s likely it’s something else, unless your dogs were diagnosed by a vet with this food intolerance. It’s super important for people to research whatever breed of dog their heart is desiring so they’ll be prepared and be certain they can handle it. I have a Siberian Husky, so we see a lot of similar assumptions and mistakes people make when acquiring the breed. Not doing research is how certain breeds continually end up in shelters! Great tips on Pyres, I’m sharing this. I didn’t realize they barked a lot! Important to know, especially if you live in an apartment. Great post! I can’t believe nobody posted about the slobbering! Had to make my pyr a custom scarf. I was surprised too! Yours was the first comment about slobbering! Fresh water refills multiple times per day. I like the idea of a custom scarf!! Love the comments on Great Pyres. I am a Pyrent to a 1 year old and she is the most awesome dog. I have a 10 acre farm and she is the patrol queen. yes she barks all night, yes she roams, yes she is very independently thinking, and yes she jumps on you or climbs in your lap when she wants loving and kisses and she is 100 lbs. This is my first Pyr and I got her because my trespassing neighbors got mad when I took them to court and poisoned my wonderful catalonian sheepdog. After six months, I purchased my pyr and she slept on my bed. I was told she would not bond with our farm animals because I allowed her to sleep on my bed for the first three months. The man i purchased her from told me to put her in the field with my livestock and leave her to her own devices so she could bond with my livestock because she came from working parents and she would be fine. At eight weeks old, I was not about to put my precious ball of white fur out in a field and leave her alone. One night when my Pyr was about 5 months old, she began hitting me in the face with her paws and nose. I slowly woke up and realized I was shaky and sweaty. I checked my blood sugar and it was 45. She has never been trained to detect high or low blood sugar but she has done it several times. When she was about six months old, she found her voice and decided she loved it outside with our Newfoundland better than she liked sleeping in the house. She has a very intimidating bark and since she decided she wanted to patrol at night, we have had no problems with any type of predators. She occasionally lets me know that she wants to sleep in the house and she has the right to. She also has had no problems bonding with our livestock. This is one of the most amazing dogs I have ever had the pleasure to love. She plays with our 2 year old Newfie like they came from the same litter. I plan on getting another Pyr in about six months. I will never own any other kind of dog. Love reading all these posts. My sweet girl is now 4 and I couldn’t imagine my life without her. My daughter has autism and at the time I got our Wynne my daughter had become terrified of dogs but Wynne fixed all of that. At one point Wynne would stand right in front of daughter blocking any other dogs from approaching my daughter when we were out for a walk. She is just the biggest and gentlest girl. Barking is frequent and loud, the shedding is out of control, and the slobbering can become a slipping hazard on hardwood floors but wouldn’t change a thing! One thing that I did find helpful with the barking to help manage it was by telling her to be a good girl and for the most part that seems to help. You just come to expect that they are just doing their job. Hi there i have a pyres is only 5 months old. We have had him for 2 months now completely potty trained with in the first month. Super smart and knows right from wrong. He doesn’t really lesson when off the leash but it’s more of I can hear you but I’m just going to ignore you lol. We where living in an apartment and just moved to 10 ace and now we are having a problem with him chewing up stuff he normally wouldn’t. We think it’s separation anxiety but we aren’t sure how to deal with this he is so sweet and kind and we love him so much. We don’t want him to feel anxious or uneasy when we aren’t there. We have left him stuff to chew on treats but he still chews on stuff like a rug never has he done that just any kind of paper mostly my lists lol. We have left him in our bedroom at the apartment once and he cryed tell we got back 3 hr later. So we don’t crate him or put him in rooms because it seems like his anxiety gets worse. We just don’t know what to do we love him so much he has the best puppy eyes ever that make your heart melt so that makes it that much harder to punish him lol. So if anyone has any ideas or thoughts on how to deal with it that would be so great. My pet is now 12 years old, he’s a rescue. I got him from a GP rescue when he was 3 yrs old, not knowing much of his history, his temperament and personality came out about 3 months after having him. I cannot help but believe he was abused and witnessed abuse. The statement above about teaching him what are and aren’t threats seem pretty accurate. He didn’t know who wasn’t a threat. I am his flock, he protects me, he protects whoever is his caretaker. Sadly, he felt he needed to protect me from everyone unnecessarily, family and husband included. Since then he has learned thru much training on our own. He’s a great dog, he loves kids, and attention from anyone who will stop to pet him he likes walks and carrides. He prefers to be wherever he is comfortable, so inside in the A/C in summer and outside in cold weather. At 12 years old and he has cancer, my boy gets whatever he wants, which is love, attention, and treats. I cherish everyday with him, we are treating the cancer, but at 12 years we know what reality has in store for us. I love that big old boy he has stolen a piece of my ♥. He still hops around outside with treats and makes us laugh everyday. Pyrenees are NOT for everyone, but they do call them “Great” Pyrenees for a reason. Know the breed before getting one and remember they are all their own beings. Focus on obedience. You need to work with them every day while they are young otherwise you’ll get a dog that does what it wants to do…buuuuuut even with all the training they’re still going to do what they want to do at times. Puppy classes help a lot, especially with both canine and human socialization as well as whatever you learn in class. Don’t worry about their double dew claws unless theybecome a medical issue. We got a defective Pyr that doesnt bark often, but your mileage may vary.